Pennsylvania’s Seventh Congressional District, which forms a misshapen U linking Greater Philadelphia in the east to the outskirts of Lancaster and Reading to its west and north, provides a vivid example of the challenges Democrats face on the current U.S. House map. It is a district that Democrats won in 2006 in their wave year, then lost in 2010. After 2010, Pennsylvania Republicans re-drew it to make it more Republican, and Rep. Pat Meehan (R) has a fairly secure grip on it. With Democrats now effectively locked out of many of the Southern and Appalachian districts that used to be a mainstay of their pre-2010 House caucuses, the Democrats’ path back to the majority almost has to travel through GOP-held suburbs and exurbs around the country: In other words, seats that look very much like Meehan’s. In 2012, Meehan’s PA-7 supported Mitt Romney over Barack Obama by about two points, 50.4% to 48.5%. Given that Obama won nationally by 51.0% to 47.1%, PA-7 is roughly three points more Republican than the nation. It also happens to be, according to Obama’s 2012 performance by congressional district, the precise median seat in the House. It was the president’s 218th-best district, and of course one party needs 218 seats for a majority in the 435-House seat lower chamber of Congress. Partly because the GOP controlled redistricting in many key states after 2010 and partly because Democratic strength is more geographically consolidated in big cities, the current congressional map gives Republicans a basic structural advantage. That a district like PA-7, which Romney won while he was losing by about four points nationally, is the median House district for Obama’s 2012 performance illustrates this. So does the fact that Romney won 224 House districts to Obama’s 211 while Obama was winning a second term (this is based on the new maps in Florida and Virginia, which improved Democratic prospects in both states — Obama won 209 as of the 2012 lines). But as we ponder the situation in the House as Republicans appear likely to nominate a potentially polarizing person — Donald Trump or Ted Cruz — to lead their national ticket, we have to consider a world in which the Democrats not only win the White House again, but win it by a bigger margin than Obama did in 2012. As we discussed last week while updating our Senate and gubernatorial ratings, the coattail effect and the higher propensity for straight-ticket voting could prove to be very damaging to the GOP with Trump or Cruz leading the party in 2016. The Crystal Ball has repeatedly asserted that, in this polarized political age, it would be difficult for one party to win much less than 45% of the two-party vote (the total vote won by the two major parties) in a presidential contest or win much more than 55%. Whereas Barry Goldwater (R) and George McGovern (D) were blown out in 1964 and 1972, respectively, with between 38% and 39% of the two-party vote, today a larger share of voters fall into the Democratic and Republican camps to start out, meaning the parties have higher support floors but also correspondingly lower support ceilings. In 2008, Obama won 53.7% of the two-party vote; in 2012, he won almost exactly 52%, the record-tying seventh consecutive White House election where neither party won more than 55% of the two-party vote (1876 to 1900 was the last time such a competitive streak occurred). To examine the possibilities of a Democratic “wave” in the House, we’ve laid out three basic scenarios based off the 2012 election result as a starting point. These scenarios examine how a one-point, two-point, and three-point increase in Obama’s two-party vote in each congressional district would affect the number of districts won by Obama and Romney. A Democratic improvement by three points nationally would reach the 55% two-party upper limit discussed above. To be sure, in 2016 there will not be a perfectly consistent change in vote support from the 2012 baseline for either party throughout the country. And there is also the possibility of a significant third-party or independent candidate emerging who could scramble this math — for now, these calculations assume that one does not, but that is far from certain. Nonetheless, a national swing across all congressional districts demonstrates the potential effects of the GOP nominating an outside-the-mainstream standard-bearer. 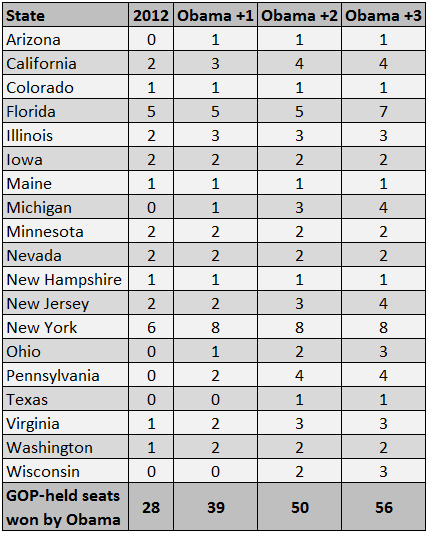 Table 1 lays out the outcomes when one moves Obama’s 2012 two-party vote up one, two, and three notches. Note: Calculations are based on the district lines as of 2016 following the changes to the maps in Florida and Virginia. North Carolina’s new map still hasn’t been finalized, but data for the Tar Heel State are based on the new map passed by the state’s General Assembly earlier this year. As of the 2012 congressional lines, Mitt Romney won 226 districts and Barack Obama won 209. If the Democratic share of the 2012 two-party vote improved to 53% nationally and increased by one point across all 435 congressional districts (and the GOP share correspondingly decreased by one point), Democrats would edge ahead in the total number of districts won at the presidential level, but only by nine seats. 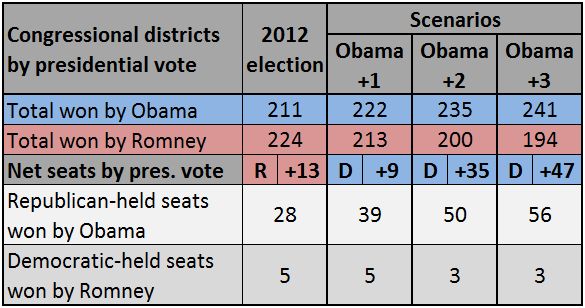 In terms of exposure, Republicans would go from holding 28 seats in Obama districts to holding 39. Considering Republicans presently hold a 247-188 edge in the House, such a shift could conceivably threaten the GOP’s majority. Still, to win back the House, Democrats would have to win almost every seat carried by the Democratic presidential nominee that is currently held by a Republican. And at the same time, Democrats would have to defend five seats won by the GOP presidential nominee. If there were no crossover district results in 2016 — an exceedingly unlikely scenario — Democrats could net 34 seats, four more than they need for a majority. This is probably a bridge too far for the House’s minority party, particularly given that some of these Obama-seat Republicans are entrenched, veteran incumbents with weak Democratic opponents. However, the next two scenarios back up an observation made by RealClearPolitics’ Sean Trende: In many states, Republican-controlled legislatures drew a large number of marginally Republican seats in order to maximize the number of seats the party could control. But a relatively large Democratic wave could inundate even some supposedly safe GOP seats, overcoming a seemingly high floodwall. Whereas a one-point increase over 2012 would result in nine net seats being won by the Democratic presidential nominee, a two-point increase (54% nationally) quickly raises that net advantage to 35 seats. Suddenly Republicans would be defending 50 seats in districts won by the Democratic presidential nominee, and two Democratic-held Romney seats would become slightly more blue than not. This would give Democrats a substantial target list to get to the necessary 30-seat gain they need to take back the lower chamber. And a three-point Democratic increase to 55%, a reasonable upper limit in our eyes, would leave 56 GOP-held seats in blue territory. Overall, Democrats would hold a presidential vote edge in 241 seats. This would be similar to the 2008 presidential vote: That year, Obama won the two-party vote in 242 congressional districts as currently drawn. What types of districts become exposed, and where are they? Well, almost all of the Republican-held districts that could come into play in any of these scenarios are located in states that Obama won in both 2008 and 2012, as shown in Table 2. Only AZ-2, encompassing the southeast corner of Arizona around Tucson, and TX-23, a giant southwestern Texas district that the two parties have swapped in three straight cycles, are in red states. About half could be safely described as suburban and/or exurban in nature. A number are in the orbit of major cities such as Chicago, Cleveland, Columbus, Denver, Detroit, Las Vegas, Los Angeles, Miami, Minneapolis, New York, Orlando, Philadelphia (including PA-7), Tampa, and Washington, DC. Some of these districts, such as VA-10, have wealthy and highly-educated voters who may not go for Trump or Cruz. Many of these 56 districts also have large nonwhite populations, including some of the more rural ones. In the case of the two red-state seats in this group, both AZ-2 and TX-23 have large Latino populations, particularly the latter, which has one of the 15-highest shares of Hispanics of any district in the House. While many of these individuals are not necessarily registered to vote (or even eligible to), it’s not hard to imagine heightened Latino turnout with Trump at the top of the GOP ticket leading to down-ballot problems for Republicans. While the GOP has a large majority to work with and are considerably more likely than not to hold onto the House, these scenarios illustrate that Republicans could find themselves under duress if the top of the ticket battle goes awry for them. Coattails and straight-ticket voting could conceivably carry Democrats back into the majority if that happened. 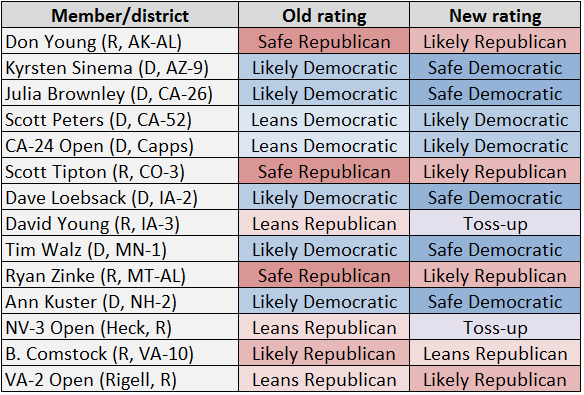 This week we’re making 14 House rating changes, with all but one of them favoring the Democrats. This has been a common theme for us in recent weeks. Two weeks ago, we offered ratings of a potential Hillary Clinton-versus-Donald Trump presidential race, which tilted the competitive Electoral College states toward the Democrats. Last week, we moved six Senate races and two gubernatorial races toward the Democrats. This is mostly because of the increasingly likely odds of the GOP nominating Trump or Cruz for president. 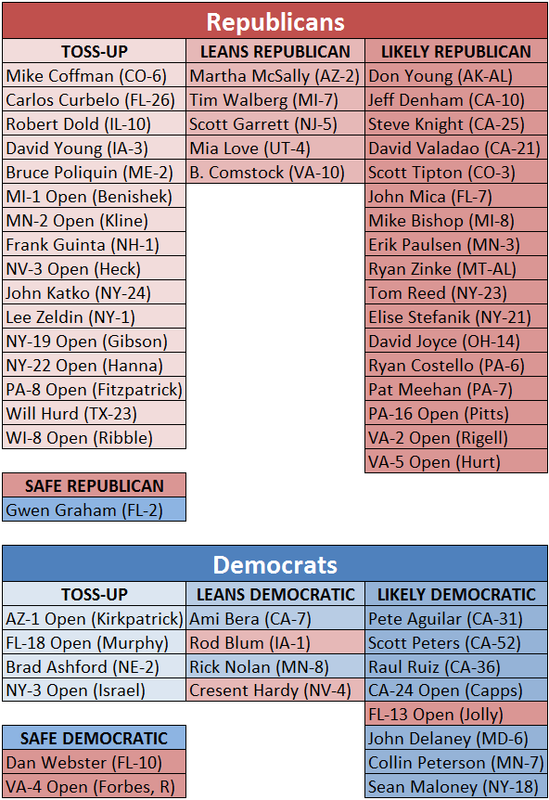 Before this update, we rated 229 House seats as either Safe, Likely, or Leaning to the Republicans, 188 Safe/Likely/Leaning to the Democrats, and 18 Toss-ups. If one splits the Toss-ups 9 to 9, it would leave the House with 238 Republicans and 197 Democrats, or a net gain of nine seats for the Democrats. The new ratings are as follows: 227 Safe/Likely/Leaning Republican, 188 Safe/Likely/Leaning Democratic, and 20 Toss-ups. Split the Toss-ups, and Democrats net 10 seats, or only a third of what they need. That is roughly what our outlook is right now — a small Democratic gain of about 5-10 seats — but as we showed earlier, the presidential math could change that calculation, swelling Democratic gains. On the flip side, Republicans still have a chance to hold Democrats to single-digits gains. A Republican net gain seems exceedingly unlikely at this point, but in this crazy cycle one cannot completely rule it out with seven months to go. The headliners here are probably the two Republican-held seats that move from Leans Republican to Toss-up: NV-3, an open swing seat held by Rep. Joe Heck (R), who is running for Senate, and IA-3, held by first-term Rep. David Young (R). Obama won both districts in 2012, and they both vote roughly with the national average in presidential elections. Neither party may have a truly top-tier candidate in either race. Young is an incumbent, but he’s hardly as entrenched as his predecessor, former Rep. Tom Latham (R), who retired in 2014. Democrats are choosing among Jim Mowrer, a veteran who unsuccessfully challenged conservative Rep. Steve King (R) in IA-4 last cycle, as well as businessman Mike Sherzan and former state Senate candidate Desmund Adams. In NV-3, national Democrats prefer synagogue leader Jacky Rosen over attorney Jesse Sbaih, to the point where Sbaih, a Muslim, accused Senate Minority Leader Harry Reid, the Silver State’s Democratic political godfather, of telling him that a Muslim couldn’t win the seat. Reid denies this. Republicans are deciding among state Senate Majority Leader Michael Roberson, the establishment favorite, as well as perennial candidate Danny Tarkanian (son of former UNLV basketball coach Jerry Tarkanian) and far-right state Assemblywoman Michele Fiore. The bottom line here is that none of these candidates has particularly deep roots, meaning that fundamentals and the presidential race really could decide things. That’s why we look at both as Toss-ups. Five of these changes push seats that were already Likely Democratic into the Safe Democratic column. Reps. Kyrsten Sinema (D, AZ-9), Julia Brownley (D, CA-26), Dave Loebsack (D, IA-2), Tim Walz (D, MN-1), and Ann Kuster (D, NH-2) occupy districts that are at least somewhat competitive on paper, but all of them seem to be in decent shape. In all likelihood, we might be checking back on some of these districts in 2018, particularly if a Democrat occupies the White House and Republicans benefit from generic discontent with the president’s party, a common affliction in midterm years that fueled big GOP elections in 2010 and 2014. But for now, these Democratic incumbents appear safe. Two additional Democratic seats, both in California, also look difficult for Republicans. Both the open CA-24 (held by Lois Capps, who is retiring) and Rep. Scott Peters’ San Diego-area seat, CA-52, were very competitive in 2014, but Democrats generally perform better in California House races in presidential years. Both of these seats move from Leans Democratic to Likely Democratic. The one ratings change that favors the Republicans is in the open VA-2, where Rep. Scott Rigell (R) is retiring. This is a district that Romney narrowly won under the state’s new congressional map, but it’s competitive on paper. However, Democrats failed to recruit a top-tier challenger: The only person who filed is Shaun Brown, a perennial Newport News City Council candidate. Republicans, meanwhile, may have a de facto incumbent nominee: longtime Rep. Randy Forbes (R, VA-4), who is running in VA-2 after his district became very Democratic in court-ordered redistricting. Forbes does need to get through a primary, but the Republican edge is growing anyway in this district: We’re moving VA-2 from Leans Republican to Likely Republican. In Northern Virginia, first-term Rep. Barbara Comstock (R, VA-10) will be well-funded and is a strong campaigner used to tough races. But her district, as noted above, could be a place where Trump or Cruz could bomb as a presidential nominee. VA-10 has the nation’s highest median income and more than half of its residents have a college degree, far above the national average (about 30%). LuAnn Bennett (D), a businesswoman who was once married to former Northern Virginia Rep. Jim Moran (D), is a promising candidate who will still need top-of-the-ticket help to beat Comstock — and she very well could get it in this swingy district with a small Republican tilt. We’re moving VA-10 from Likely Republican to Leans Republican. Finally, three other Republican-held districts move from Safe Republican to Likely Republican, mostly out of an abundance of caution. Reps. Don Young (R, AK-AL), Ryan Zinke (R, MT-AL), and Scott Tipton (R, CO-3) all have drawn intriguing Democratic challengers, and if a down-ticket Democratic wave develops, perhaps all could be vulnerable even though their districts — statewide districts in the case of Young and Zinke — are significantly more Republican than the nation as a whole. It’s hard to imagine any of them actually losing. But, then again, it’s hard to imagine Democrats winning back the House. However, that remote prospect is getting at least a little more plausible because of problems at the top of the GOP ticket. And if the Democrats do indeed threaten the GOP House majority, they will probably be putting House districts in play that at this point do not seem all that competitive. Perhaps one of these districts would qualify. Last week, we noted that Nebraska appeared likely to change its method of allocating electoral votes by congressional district, moving instead to the winner-take-all system used by every other state except Maine and Nebraska. But, in a surprise, conservatives who supported the change fell one vote short of breaking a filibuster, so the system will remain in place for the 2016. So Democrats continue to have an outside shot of winning an electoral vote in the Omaha-based NE-2, a House seat that is held by first-term Rep. Brad Ashford (D). Ashford is one of the few truly vulnerable House Democratic incumbents in the country, although he is well-liked back home and his potential Republican opponents do not look particularly imposing.